Jenni Dutton is a highly regarded multi media artist based in Somerset who has been interested in drawing and making things for as long as she can remember. Copying artists’ drawings and customising her clothes whilst still at school, Jenni was encouraged to go to art school in London where she took a fine art degree. A period working as an art teacher and running the art department of a large secondary school gave Jenni little time to exhibit, but plenty of time to research other artists and to experiment with different materials, tools and techniques. 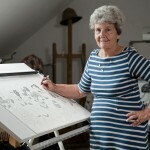 “The Darnings were started in 2011 whilst I was a carer for my mum who was developing dementia. 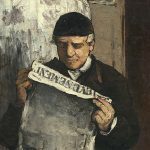 As I began to have some understanding of the illness and how it developed, we explored ways of engaging with the past, often looking at old photo albums. 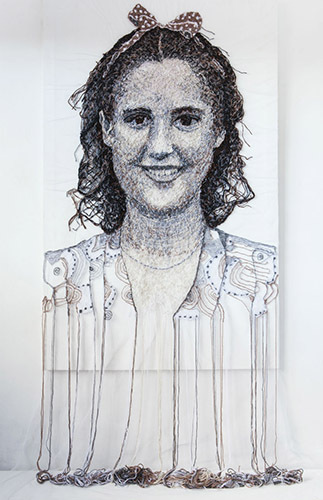 I started to use stitching to ‘draw’ likenesses of family members onto a sculpture of a long dress I had made from dress netting. She recognised these familiar faces and enjoyed watching me create these simple portraits. I then challenged myself to choose one of the images and made a very large portrait using this stitching technique on fine netting suspended from the ceiling in my studio. I used a familiar photo of my mum taken during the Second World War. The Dementia Darnings are made like drawings where crosshatched marks are built up on paper. I use a simple running stitch using threads of tapestry wool. The wool is made up of four strands twisted together. I work from photographs and sew direct into the netting stretched over canvas. Each of the latest Darnings take about four months to make. 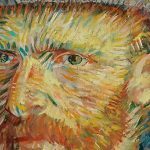 I think there is an intimacy in the way they are made, an intimacy that could not be reached through painting or drawing. I always feel these textile portraits are somehow ‘built’; it’s hard to explain. There is an element of meditation when I am making the work; sometimes I lose myself as I sew intuitively, referring back and forth from the photo to the canvas without thinking too much along the way. Sometimes when a piece is completed, I will then remove a lot of the threads, so I am able to develop a concept; of ageing, of loss, or deterioration, sometimes even cutting into the fine netting, (bobinette) which is supporting the sewn threads, further emphasising the frailty of the subject matter. Or I may add dramatic trailing threads so the image looks like it is unravelling”. 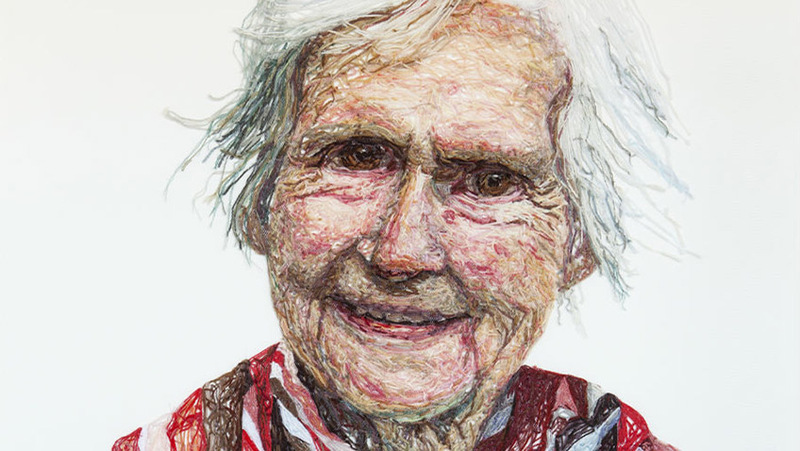 You can see Jenni’s The Dementia Darnings at the Textile Galleries at The Knitting & Stitching Show at Alexandra Palace from 11th to 14th October 2018 and Harrogate from 22nd-25th November 2018.